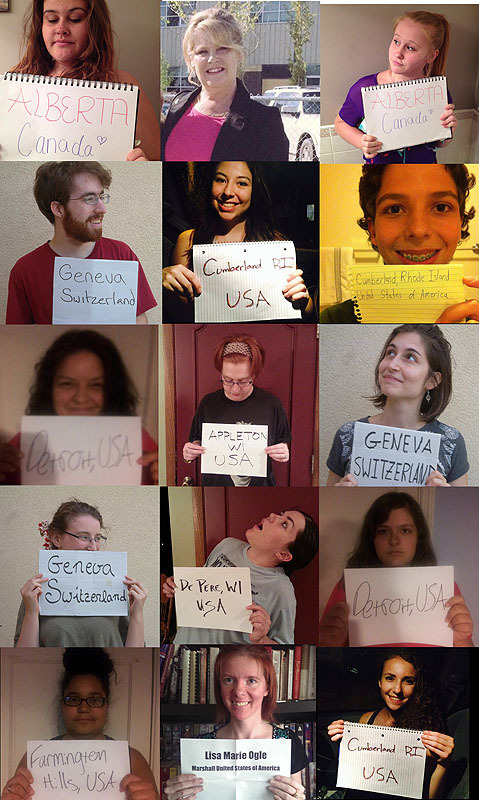 The Greatest International Scavenger Hunt the World Has Ever Known (GISHWHES) has kept me mostly silent this past week as I have run around town being generally insane. The contest has now ended, although it will be at least a month before winners are announced. The contest was a week long and consisted of 185 items for teams of 15 to potentially accomplish. Some are simple, like take a CPR course (which a friend and I completed) or learn an archaic skill from an elderly person (one teammate learned how to use a slide rule). 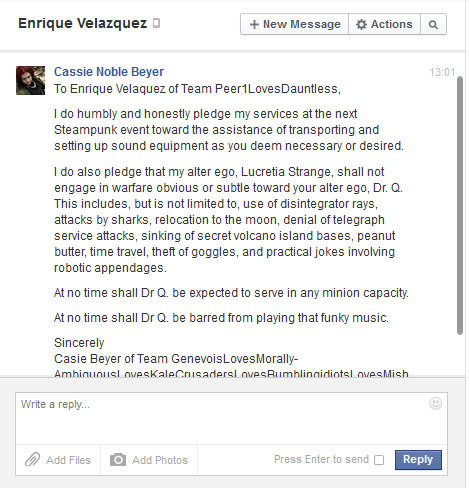 Some are impossible or nearly so, such as getting something labeled GISHWHES into space. Some are about charity and kindness (the event supports the Random Acts charity). Some about publicly making a fool of yourself. Two were about math. Some…I’m not sure how to categorize. An image of each of the members of your team in Brady-Bunch style grid format. Photos should be mug-shot style with each team member holding a black and white sign stating their city and country of residence. Here are some of the highlights of the local team. It’s “me time.” Spoil, pamper and be decadent to yourself like you never have before. 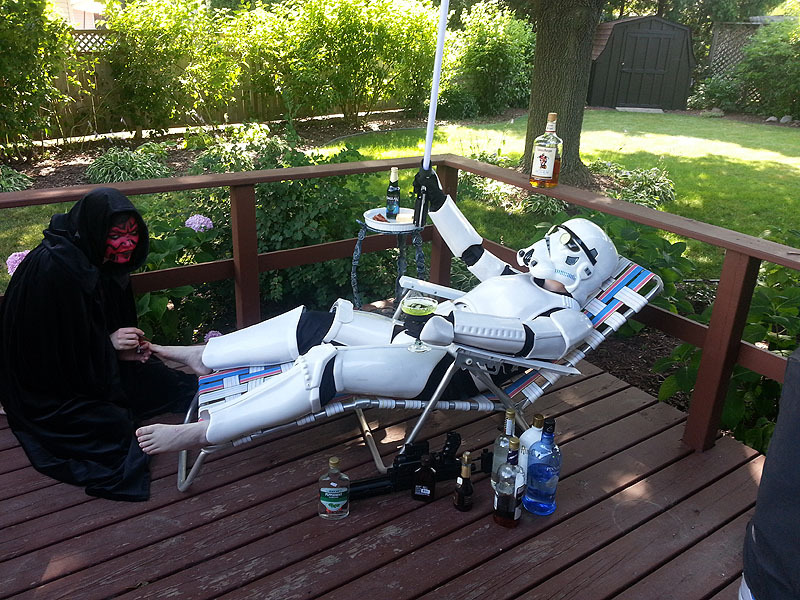 Oh, and PS, you’re dressed as a stormtrooper. It’s the cucumber slices on the eyes that really sell it. I’m the one in the suit. The suit was damaged, so we couldn’t use the back plate, which meant we couldn’t secure the front, and everything else hung off the front via straps. So we laid me back and then dressed me. Our subservient Sith is wearing lipstick for the brilliant red tone. It took ages to wash off, but we didn’t have face paint. 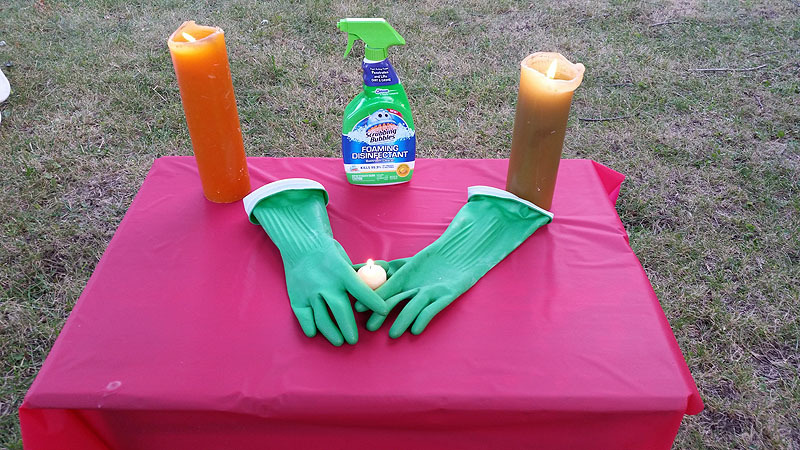 Find someone on another GISHWHES team and surprise them with an act of thoughtful generosity. Make us tear up. We must see the team name or Username of the individual you are helping. GISHWHES isn’t just about the letter of the item. Creativity and humor are encouraged. Which kind of made a few of us go overboard. Shoot a potted plant off a fence post with a potato canon. Not a potato gun, a potato canon. This is one of those times when sentences like “Oh, about that not having a costume…I found a totally awesome pirate costume in the basement,” doesn’t make anyone even blink. We had two problems here. First is the safety issue, which we discuss in our skit. There was nowhere we could fire a projective without threatening whatever lay on the other side. The second teeny tiny problem was even after long hours of work, we couldn’t get the damn thing to actually fire. So, no PSI turned into a PSA. Stage a mini-newspaper boat regatta in a public fountain with at least four competing vessels. We must see intense competitiveness and gambling. Unfortunately for Mr. Shattner, our Kirk is played by Chris Pine. Erect a tribute to Horris Packard, the inventor of Rubber Gloves. We don’t have to complicate absolutely everything. I express my objection to the request. Install an official-looking velvet rope on a sidewalk (roping the sidewalk closed). When people approach, prove that chivalry is not dead by graciously holding the stanchion open for them. Note: in the absence of a stanchion you can use a doorway that you installed in the middle of the sidewalk with an operable door,which you politely open. 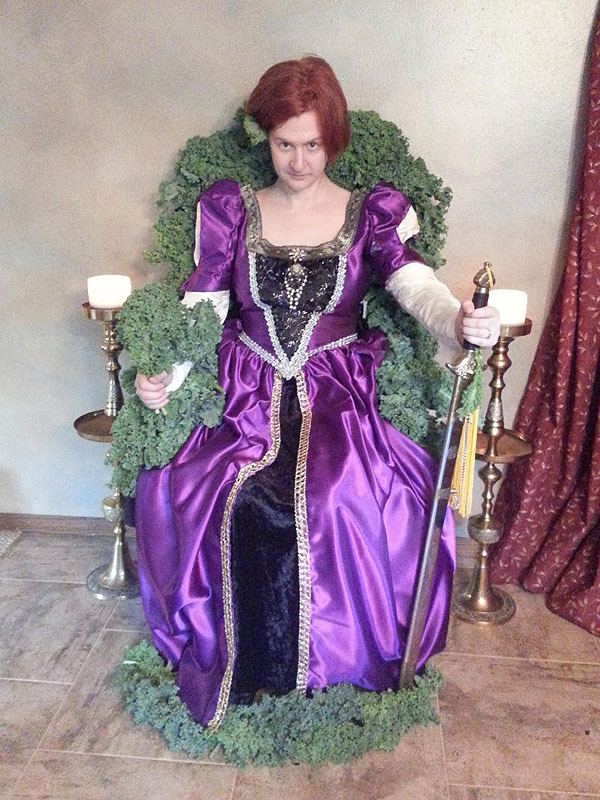 You or your pet, in period costume, seated on a Game of Thrones-style kale throne. Never expected I’d have a use for THAT dress again. I made it when I was about 16 and crafted it out of someone’s old prom dress, hence the hideous satin. 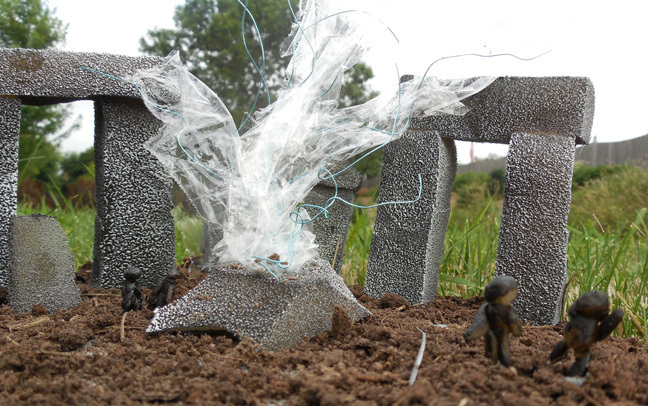 Recreate a scene from the cinematic masterpiece “Stonehenge Apocalypse” in miniature -measured to the HO Scale, 1:87 ratio (humans should be around 2cm/20mm tall). Use whatever materials you desire but YOU MUST make everything yourself. Originally, I was going to electrocute Lego people, until we realized they are too big (and not made by me). 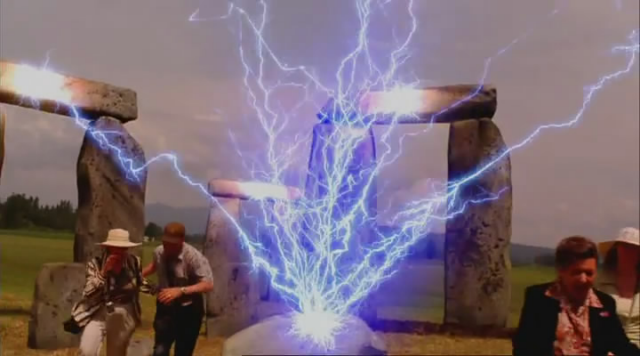 You should all watch Stonehenge Apocalypse. It’s awful. It also made a bit of the historian in me die. The scene I was recreating. More to come. I have GenCon to prepare for tonight, and I will be offline for the rest of the week.